I suppose you read my blog post on custom RSS feeds. I wanted to give a small update, as the solution described there was not sufficient. In the end I needed to output an XML file and every item had to be in the same format. As I was outputting the last node for three different content types, I needed to do some custom coding. The node_feed function was not the ideal solution. 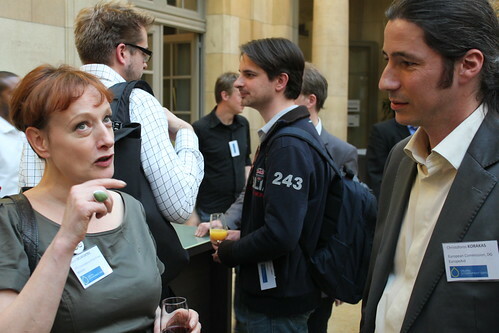 Last week I went to the drupal government days. On thursday I was able to have a quick chat with Dries. And apparently my friend Nektarios Sylligardakis took a picture of it. Thanks!